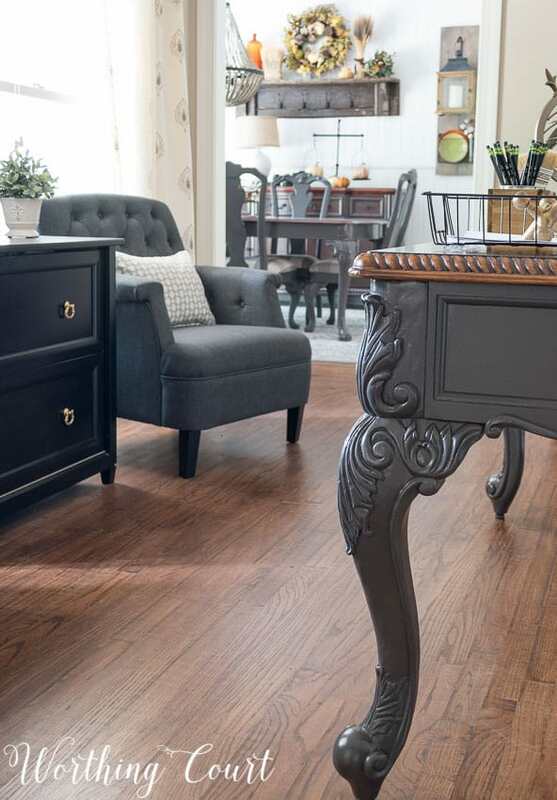 All too often folks think a styled home has to cost an arm and a leg to decorate, but it really doesn’t. You’d be amazed at how great you can make any room look on the cheap! 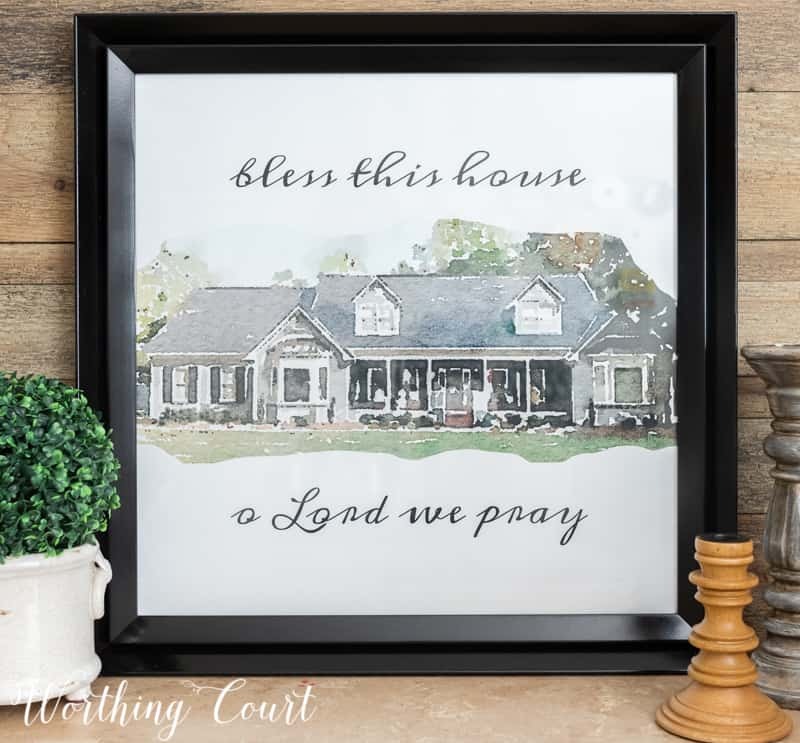 I’ve been enamored with home decorating ever since I was a little girl and used to dream about the day that I would have my very own place to decorate. When that finally happened, reality set in and I realized that my dreams didn’t necessarily align with my wallet. I couldn’t always afford to run to the store to buy whatever I wanted to give me the look that I was after. I quickly learned that DIY was the way to go and that’s a habit that has stuck with me all these years. When Pinterest and the endless shows on TV came along, DIY-ing got way easier. I’ve always enjoyed the challenge of figuring out ways to recreate the look that I love without spending an arm and a leg – here are some of my absolute favorite ways to decorate on the cheap. 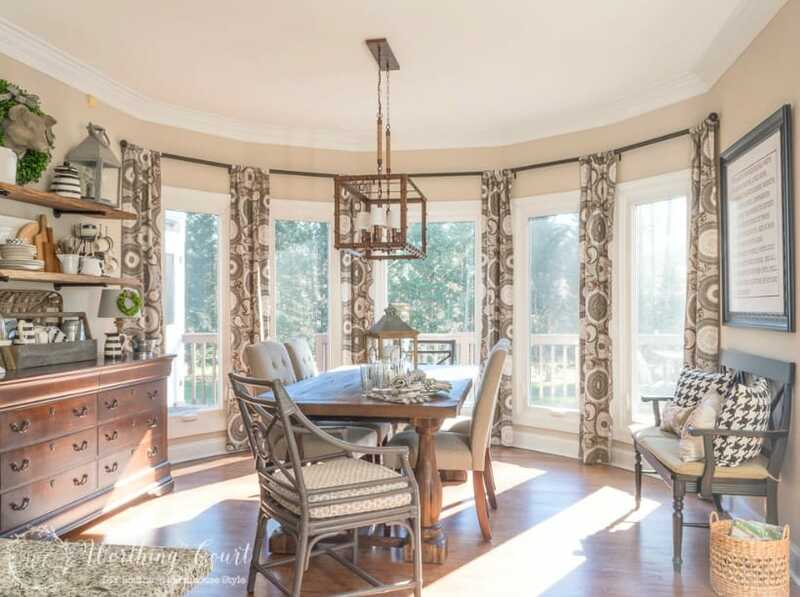 When it came time to makeover the breakfast room of our new-to-us home, one of the last things that I added were the window treatments. Our breakfast room includes a large floor to ceiling bay window and I just knew that drapery hardware was going to cost me a fortune! I wanted something simple that would go along with the industrial vibe of the open shelves and the farmhouse look of the rest of the room. Of course Pottery Barn, Crate and Barrel, the big box home improvement stores and online stores had the hardware, but it came with a hefty price tag. So after brainstorming a bit, I realized that I could create exactly what I needed at a fraction of the cost. 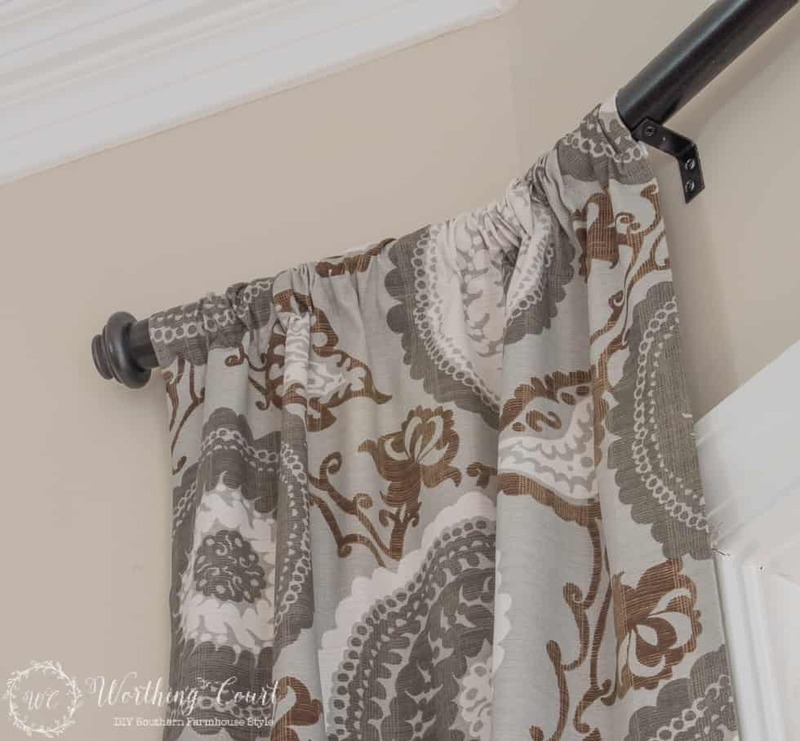 My idea included a trip to the big box home improvement store to pick up pvc pipe, angle brackets, inexpensive drapery finials and some spray paint. Y’all, this entire project was super easy and cost me less than $30! Even though this hardware was made for a bay window, you can use this idea for a regular window too. Get the full tutorial HERE. I feel like I preach about this all the time, but I can’t stress enough that paint is one of your best friends when it comes to refreshing your home. Whether it’s painting the walls or some furniture, it will truly transform anything! Before I changed from my formerly dark, Tuscan’ish decor to farmhouse decor, most of my furniture was stained in oak, pine or cherry. While some wood-grained furniture is great no matter the style, I also wanted to mix it up and this desk was among the first I experimented with to have a mix of painted and stained finish. I’ll fully admit I was a bit apprehensive about how it might turn out, but in the end, I fell in love. In fact, I fell in love so much that I’ve taken this dual finish approach to several other pieces, including my dining room table. Take a closer look at the desk makeover HERE and read about painting my dining room furniture HERE. 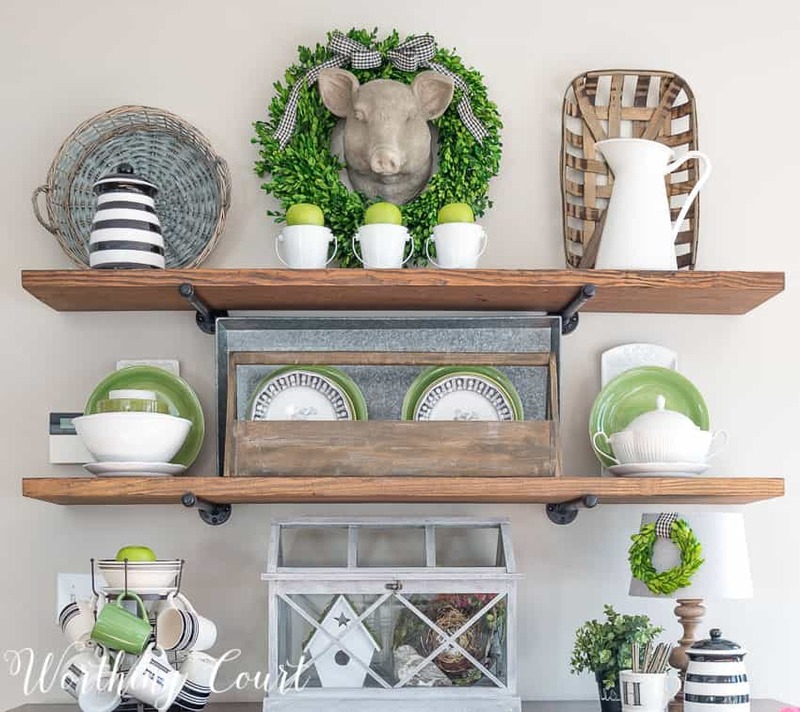 Yes, all savvy shoppers know to look for sales when shopping for just about anything, but you can’t talk about decorating on a budget without mentioning their impact on your budget. Many of the home decor stores where I shop have their own phone apps that include coupons or discount codes. To name a few, some of the apps that I use are for stores like Hobby Lobby, Michael’s, Target and Kirkland’s. One other tip – if you are retired or active military, and have a military id, ask about a military discount! I’ve been amazed to find out how many stores honor the military by offering a 10% or more discount on your total purchase. Stores like Lowes, Home Depot, At Home, Michael’s, William Sonoma, Sur La Table, some clothing stores and restaurants and so many more. Some stores will even allow you to stack your military discount on top of their coupons. That’s a win win for sure! This is just the tip of the iceberg, but you can get a list of 230 places and services that offer a military discount HERE. 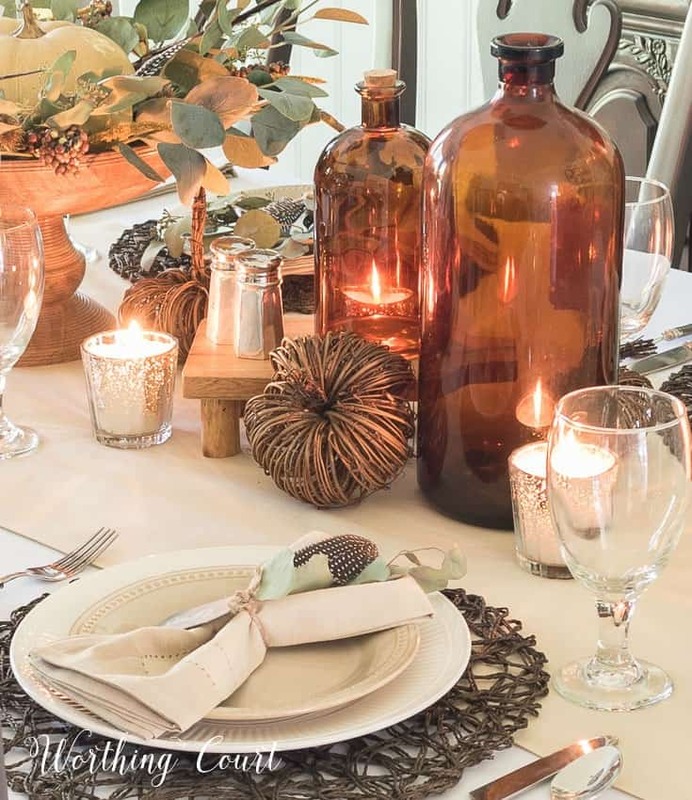 This Thanksgiving table is just one example of what I like to call ‘smart shopping’. I needed lots of eucalyptus for decorating my table (for the centerpiece, place settings and other spots on the table), but I don’t have a resource for inexpensive live eucalyptus, so faux it was. Instead of spending a lot of money on individual stems, I waited until greenery was on sale (half off!) at Hobby Lobby and bought a couple of bushes of faux eucalyptus. To make my purchase go farther, I used a pair of wire snips to cut the bush into individual pieces to use wherever I needed it. I do this all the time with all sorts of faux greenery and florals! 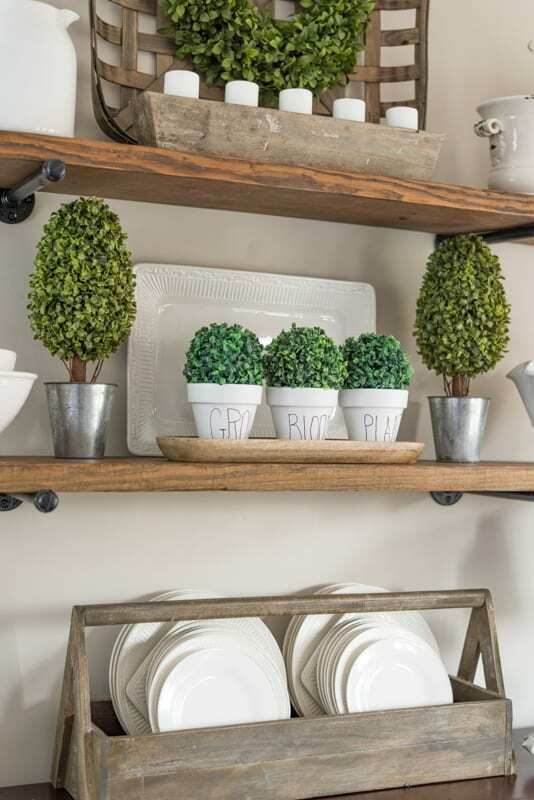 This is just one small example of smart shopping, but ideas like this can really make a difference in how much you spend on your home decor! When I was looking for inexpensive dishes to use on the open shelves in my breakfast room a while back, I visited my usual stores but to no avail. I knew these dishes were more for looks than actual use, so I didn’t want to pay top dollar for them. On a whim, I decided to stop in at Dollar Tree. I used to overlook this store figuring it had no decor dynamite to be found, but I was wrong, wrong, wrong. I’ve found a variety of basic items there that have worked well among the rest of my decor and haven’t broken the bank to do so. 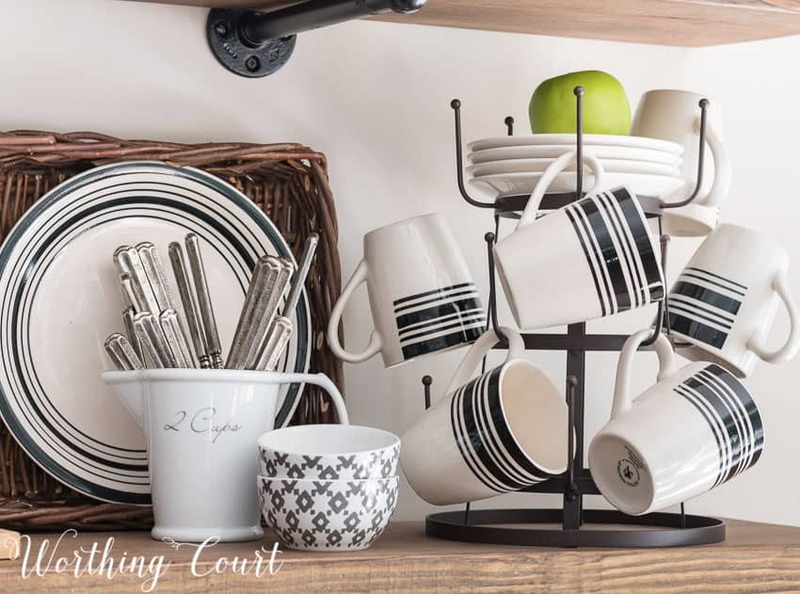 So when I was looking to jazz up the breakfast room for late summer, I knew I wanted some white dishes with a classic stripe pattern and Dollar Tree delivered (well, not literally, but you know what I mean). I was able to get a variety of plates and mugs for a steal of a total price. And bonus – I’ll be able to use these over and over! Behold the bargains, baby. See more of my late summer breakfast room and shelves HERE. While I have picked up a paint brush or two in my time, I accept that I’m no artist. However, with the help of handy-dandy technology and easy phone apps, that isn’t a hindrance anymore! I wanted to add a custom piece of art when I gave our foyer a makeover and I stumbled upon the Waterlogue app my phone. Skip the trip to the craft store and head to the iPhone App Store and drop $5 for this fun app instead. I used a photograph of our home, that I took with my phone, and created this great piece. Everyone who visits wants to know who painted it. It’s hard to believe that it isn’t a true watercolor painting – right? If you’re looking to create a one-of-a-kind piece of art for yourself or as a gift for someone else, this app is for you! Trust me…. you’ll have a blast playing around and for $5, it is money well spent. Get my step-by-step tutorial for this fun project HERE. When decorating for spring a while back, I had my eye on a set of Rae Dunn pottery pots that I wanted to use on my tiered tray, but I balked at the price. I wasn’t willing to spend the $75 price on Amazon for such a simple display, even though a matching tray was included in the set. So, with very little effort, I was able to knock off my own Rae Dunn lookalike version for less than $10! I know you can’t always reproduce what you see in stores or online, but many times, with a little ingenuity, you can or you can at least get the basic look. 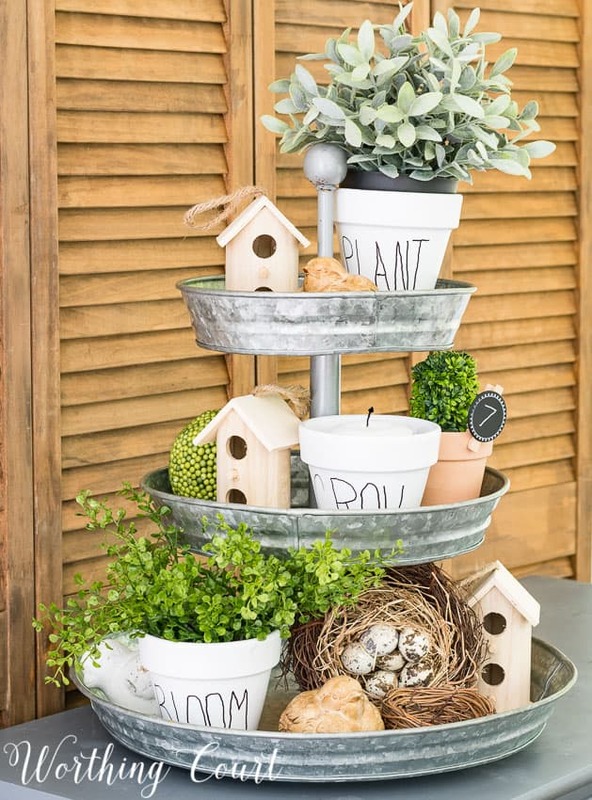 Get the full tutorial for these cute pots HERE. So while there are some items that are worthwhile to splurge on, often times you can replicate the look you want with a price tag you can afford. Sure, not every DIY project turns out like gold, but you live and you learn and you GROW. Don’t be afraid to get your hands dirty – go off the beaten path and try something new! My husband needed help coming up some steps from the garage and there was not a handrail. Having a contractor install a handrail was going to be more than we wanted to spend so we went to Lowes and purchased a sturdy drapery rod. After finding studs to attach it to it worked perfectly and was lots less expensive. Maybe $30. total at the most. These are great ideas! Thank you so much for sharing! I don’t have an iPhone but I’m going to ask my DIL to download the app and do the print for me!